Today’s first responders need a tool on their person that illuminates and identifies them in most any given situation. This means a tool that first responders can wear in a manner that will illuminate them in every direction when they need it, be it the roadside, in a crowd, in the woods or from far away. It needs to be bright and a beacon for other first responders. It must allow officers to be able to keep their hands free or other emergency personnel to focus on their tasks without worrying about light. It must also readily identify the wearer as emergency personnel to those who need them or should recognize them. This means being available in colors of emergency personnel and offering a strobe function that captures the attention of others. This tool should be easy to use, easy to wear, durable, easy to train with and have functionality beyond anything first responders have ever seen, yet not another complex “tech tool” that simply falls to the wayside. Must-have features in wearable lighting systems for first responders. Any system designed to help first responders accomplish their mission and potentially save lives must be designed with them in mind. 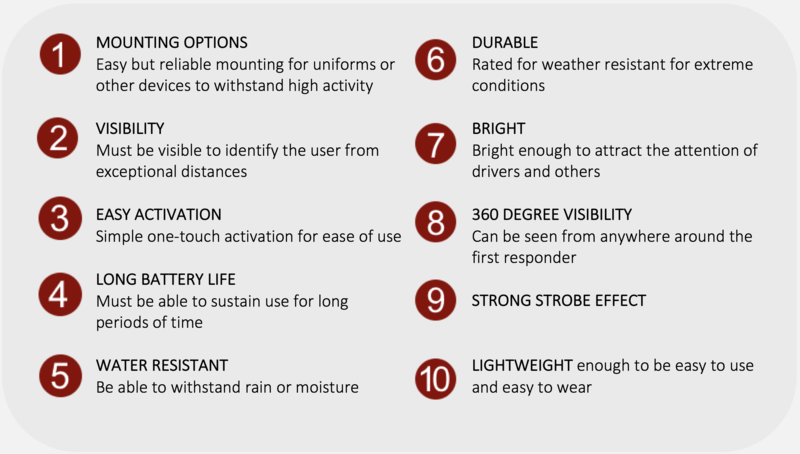 When researching a wearable lighting system, be sure to insist upon the following features.